Phoenix Wright: Ace Attorney marks the return of Phoenix to the courtroom. 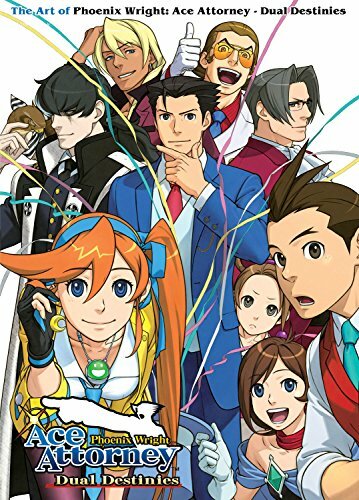 This is a nice visual companion for fans of the fifth game in the Ace Attorney series. . Collected within this 240-page paperback artbook are the character profiles, character art, character expressions, environment art, prop designs, cut scenes, storyboards and miscellaneous illustrations. The artworks are beautiful and all fans should be able to appreciate that. I like the character sketches and all the scribbled notes by the artists. The character drawings can be quite humorous looking at times. There are lots to read on the characters, and the scenario director Takeshi Yamazaki and art director Takuro Fuse would add their own commentary regarding the design and story. That's in addition to the interviews with the two at the end. The book's packed to the last page. It's a great video game artbook for the fans.